The National Audit Office (NAO) scrutinises public spending for Parliament. We help to hold government departments and the bodies we audit to account for how they use public money. Each year, we audit the financial statements of all government departments and many other public bodies. We also produce a variety of other work including value-for-money reports, investigations, good practice and reports to the Committee of Public Accounts as well as other Select Committees. We are responsible for preparing and maintaining the Code of Audit Practice that sets the framework for auditors of local government, and bodies such as NHS trusts and police commissioners. We also have the power to provide evaluation, commentary and advice of a general nature to local bodies. Our work – with the Committee of Public Accounts – leads to audited savings worth many millions of pounds: almost £1.15 billion in 2014. It also helps public service managers to improve performance and service delivery, nationally and locally. Key areas of the NAO’s work. We certified 442 accounts in 344 organisations in 2014-15. Bodies we audit include government departments, charities and some companies. We published 49 value for money reports and 3 financial reports in 2014-15. We highlight important lessons for the bodies we audit and for government more widely. We published 13 investigations in 2014-15. This work enables us to respond quickly to important issues that public bodies face. Our work focuses on robust financial management, using information better and areas where MPs and others have concerns. 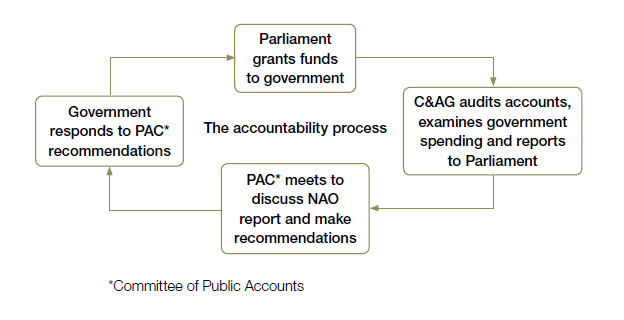 We help the Committee of Public Accounts (PAC), other Select Committees and individual MPs in their scrutiny of public spending and service delivery.The PAC held 60 hearings based on our work in 2014-15. We also supported 24 other Parliamentary committees. We are on the UN Board of Auditors for a six-year term and audit a range of other international organisations. We report on EU spending in the UK. We are a member of the INTOSAI* Board. In addition to the five key areas of work shown above, we also publish our annual report and accounts, business plan, strategy, transparency report, sustainability report and a diversity and inclusion strategy. Who is the Comptroller and Auditor General and what is his role? The Comptroller and Auditor General (C&AG), Amyas Morse, is an Officer of the House of Commons. The C&AG was given explicit statutory powers to carry out value for money work in the National Audit Act of 1983. The Act states that the C&AG may“…carry out examinations into the economy, efficiency and effectiveness with which any [government department or other relevant body] has used its resources in discharging its functions”. As well as government departments and agencies, the 1983 Act allows the NAO to undertake value for money work in a range of other organisations where public money is spent, such as NHS Trusts and universities. The Act does not allow the C&AG to question the merits of policy objectives. This is vital in safeguarding our independence and objectivity and means we are free from political influence. We do however examine how policy is formulated, and frequently examine aspects of the policy-making process. The specific powers and duties of the Comptroller and Auditor General and the NAO are laid down in acts of Parliament.